One thing you can say about Otis Redding is that he didn't shy away from long album titles. 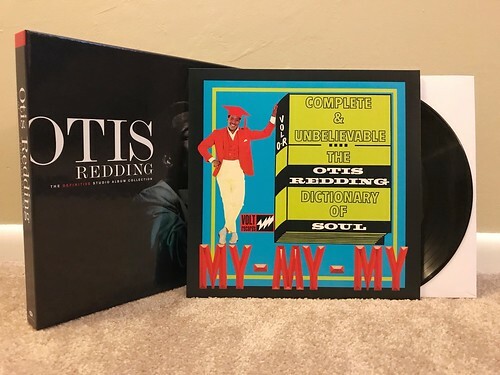 Complete And Unbelievable...The Otis Redding Dictionary Of Soul is the longest album title and yet another where the word soul is featured. In my opinion Otis absolutely earned the right to use the world soul wherever he wants. In many ways he's the king of soul to me and this album is another that cements his status as one of the greatest of all time. The album starts off with one of his best, "Fa-Fa-Fa-Fa-Fa (Sad Song)." The earnest way that Otis delivers the lyrics couple with the accents of the horn section simply create magic. This is one of my very favorite Otis songs and it's just the start of a pretty incredible album. Whether he's working with a slower song like "Tennessee Waltz" or something more upbeat like "Love Have Mercy" or putting his own signature stamp on The Beatles' "Day Tripper" pretty much everything on this record is simply great. Even in a discography as strong as Otis Redding's, Dictionary of Soul stands out as something special.